Elo Ozumba dribbles at a defender. The junior forward scored a late goal for Northwestern, but it wasn’t enough to pull out a victory in a 2-1 loss to Michigan State. Northwestern came into Saturday’s game against No. 20 Michigan State off two straight overtime games, and it showed. After beating then-No. 2 Notre Dame at Toyota Park last Tuesday, the Wildcats (4-10-1, 2-4-1 Big Ten) were brought back down to earth by the Spartans (11-3-1, 4-2-1), who beat NU 2-1 in East Lansing. Coach Tim Lenahan said back-to-back overtime victories took a toll on NU’s fitness. Still, the Cats had opportunities early in the first half to grab the lead. In the 16th minute, sophomore midfielder Camden Buescher headed the ball wide of the net off a corner kick, and senior forward Mike Roberge, who scored the game-winner against the Fighting Irish, had two shots on goal before halftime. After that, though, NU struggled to create scoring chances, mustering only four shots over 90 minutes. “We struggled to hold possession all game, so we weren’t able create much offensive pressure,” junior forward Elo Ozumba said. The Cats’ defense played well in the first half, as Michigan State only managed three shots before halftime. Junior goalkeeper Francisco Tomasino came up with two saves to help NU to a 0-0 scoreline at the half. But the Spartans finally broke through in the 51st minute when midfielder Giuseppe Barone flicked the ball into the lower right corner of the goal from six yards out. Then, in the 74th minute, Michigan State doubled its lead off forward Ryan Sierakowski’s header. “In the second half they made some adjustments, and as soon as they made those adjustments, they were able to get more opportunities,” Tomasino said. 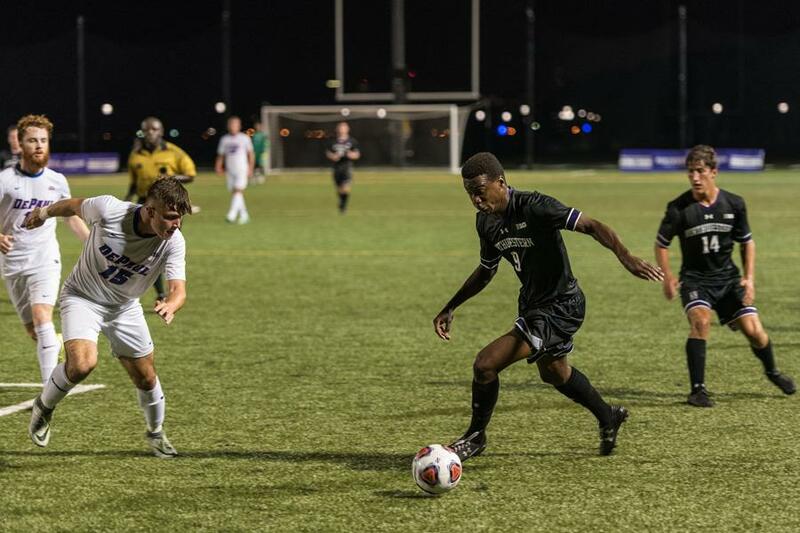 The Cats finally got on the board in the 87th minute, when senior Jeff Hopson corralled a loose ball in the box and found the feet of junior Elo Ozumba, who put the ball in the left corner of net. Ultimately, it was too little, too late for NU, as the team’s late rally wasn’t enough to send the team to its third straight overtime game. “We didn’t play well enough to win on the road against a top-15 team,” Lenahan said. The Cats aren’t out of the fire yet, as they will face their third consecutive ranked opponent when they host cross-town rival No. 15 Loyola on Wednesday night. The game is NU’s second-to-last of the regular season, and the local rivalry still means something to the team despite the difficult year so far. “Usually the game against Loyola, since it’s a cross-town derby, it can be pretty emotional and adrenaline-charged,” Tomasino said.